Those who have been observing the annual Pune Connect event for the last 6 years may well conclude that Disney’s mantra has inspired Pune’s startups. As an action-packed Nov. 19thdrew to a close,the abiding impression participants of Pune Connect 2016 were left with was just how varied, vibrant and promising the Pune startup scene really was. As the primary showcase for Pune’s startups the event, organized by SEAP, has been attracting attention for a few editions now, and 2016 was no different. The precursor to the event is the call for applications from startups keen to exhibit in the startup showcase and this year, just like the last 2 editions, over 100 startups applied when this call went out. After a rigorous screening of their applications and multiple rounds of interviews with our EC members over 30 made it to the showcase. What stood out this year was the range of areas the startups were seeking to make their mark in. Pune has traditionally beenseen asa software or IT city but this year the applicants cast their net far beyond that. There were companies looking to make homes and cities smarter, manufacturing-focused solutions, robots, and innovative electric cycles in addition to startups looking to leverage technology and the consumer internet for new and interesting ways to solve consumer issues. A key part of the event is designed to offer some concentrated doses of wisdom for the attendees, who are drawn from the wider Pune startup eco-system as well as some yet-to-be-entrepreneurs. 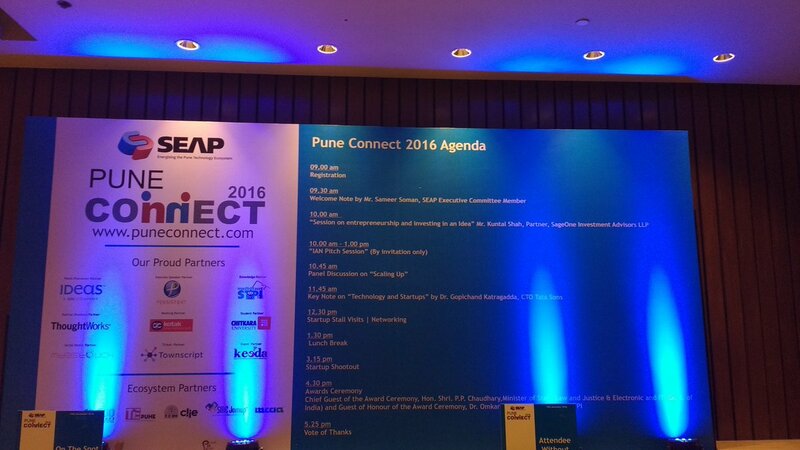 Pune Connect 2016 kicked off with a very informative talk by Mr. Kuntal Shah, of Sage One Investments, on a topic of deep interest to investment-hungry startups. He presented the VC’s perspective on “Investing in an Idea.” Apart from great information on what VCs look for while deciding on an investment, a segment the startups found particularly useful was his views on the mistakes startups make over that process. Startups that had already made a beginning and were looking for answers on how to chart an explosive growth path were enthralled by the panel discussion that followed on “Scaling”. The panelists were 4 Pune entrepreneurs who had “been there and done that”. Monish Darda, Shridhar Shukla, AjitPatil and ShachinBharadwaj spoke candidly and passionately about their own experiences of the various challenges they had faced, and overcome, as they set about building their successful ventures. The segment contained a wealth of information on everything from what to do with funds, hiring, market segmentation and the signs to look for that could signify it was time for the founder to leave. Look for the startups that attended this segment to grow sharply now! The keynote address, by Mr. Gopichand Katragadda, CTO of Tata Sons, focused on technology-led innovation. In a word, this session was inspirational! As he charted the history, the present and the future of innovation in India one could almost see the excitement among the Pune startups in attendance. As the anecdotes about innovations from India’s oldest recorded history to the shop floors of Tata factories, today added up – it was hard to escape the feeling that Pune’s startups were being subtly drawn into a wider national innovation movement, with Mr. Katragadda at the helm. All of the post-lunch session was dedicated to the startups - time for the visitors to view them and their offerings in the exhibition. The exhibition area was buzzing with excitement. This was crunch time for the startups as potential investors, mentors, associates and even potential customers sought out and interacted with them. Selected startups also got a chance to pitch to members of the Indian Angel Network in closed-door sessions. Then it was on to, what most consider to be, the highlight of the event. A final shortlist of 5 of the exhibiting startups got an opportunity to pitch to an all-star judging panel for the startup awards. The shortlist included a startup focused on converting ordinary cycles into electric cycles, one that used Machine Learning technology to help B2B sales, a startup that analyzed the social profiles of potential loan-seekers to approve payday loans, and a virtualization technology startup.The startups exhibited great conviction in their ideas and tremendous passion in the face of insightful questioning by the judges. The chief guests for the event were Union Minister of State for Electronics and Information and Technology and Dr. Omkar Rai, the Director General of the Software Technology Parks of India. Before presenting the awards to the winning startups the MoS and Dr. Rai presented a most encouraging view of how the government and the STPi were committed to supporting the growthof these sectors - great news for all the startups looking to make their mark here. The culmination of the wonderful day was the announcement of the awards, Early Salary won the big prize as the winner of the startup shootout but it’s fair to say that all the startups that attended the event won in some way or the other! The startup ecosystem in Pune is thriving, and over the last 6 editions,Pune Connect has become a central part of that landscape. Given the success of this year’s event it seems clear that next year will be even bigger and better – will you be ready?